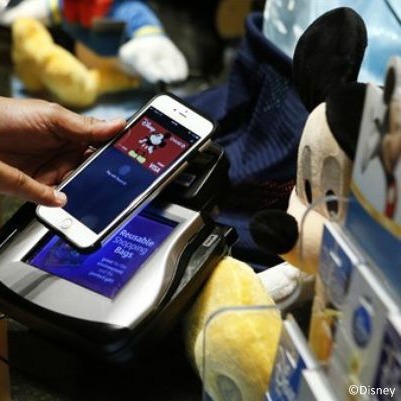 POSTED: Fri, 12/12/2014 - 06:00 | POSTED BY: Traci C.
Apple Pay was rolled out at Walt Disney World on December 10. Apple made the announcement about Apple Pay earlier this year and Disney was on the list of merchants where the service would be available. At the time of the announcement a Walt Disney World spokesperson told the Orlando Sentinel that "[Disney] guests are going to love the convenience of Apple Pay, which will bring an easy, secure and private way to make purchases at Disney Store and Walt Disney World Resort." Guests at Walt Disney World have been able to make purchases using their MagicBands and those charges go on their room accounts. However, guests who are not staying in a Disney resort hotel or those who might be visiting for the day are unable to pay this way. Apple Pay supports credit and debit cards from American Express, MasterCard, and Visa and payment is made in a single step with an iPhone6 and with the new Apple Watch that debuts in 2016. Have you used Apple Pay at Walt Disney World? We'd love to hear about your experience in the comments. I think this whole concept is pretty cool.